Hillbilly Elegy is a passionate and personal analysis of a culture in crisis—that of white working-class Americans. The disintegration of this group, a process that has been slowly occurring now for more than forty years, has been reported with growing frequency and alarm, but has never before been written about as searingly from the inside. J. D. Vance tells the true story of what a social, regional, and class decline feels like when you were born with it hung around your neck. The Vance family story begins hopefully in postwar America. J. D.’s grandparents were “dirt poor and in love,” and moved north from Kentucky’s Appalachia region to Ohio in the hopes of escaping the dreadful poverty around them. They raised a middle-class family, and eventually one of their grandchildren would graduate from Yale Law School, a conventional marker of success in achieving generational upward mobility. 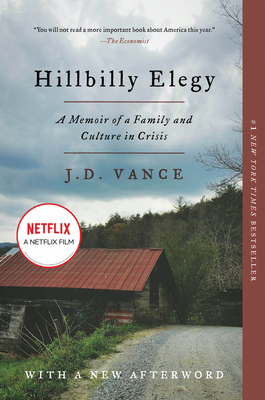 But as the family saga of Hillbilly Elegy plays out, we learn that J.D. 's grandparents, aunt, uncle, sister, and, most of all, his mother struggled profoundly with the demands of their new middle-class life, never fully escaping the legacy of abuse, alcoholism, poverty, and trauma so characteristic of their part of America. With piercing honesty, Vance shows how he himself still carries around the demons of his chaotic family history. J.D. Vance grew up in the Rust Belt city of Middletown, Ohio, and the Appalachian town of Jackson, Kentucky. He enlisted in the Marine Corps after high school and served in Iraq. A graduate of the Ohio State University and Yale Law School, he has contributed to the National Review and the New York Times, and works as an investor at a leading venture capital firm. Vance lives in Columbus, Ohio, with his family. [A]n American classic, an extraordinary testimony to the brokenness of the white working class, but also its strengths. It’s one of the best books I’ve ever read… [T]he most important book of 2016. You cannot understand what’s happening now without first reading J.D. Vance. To understand the rage and disaffection of America’s working-class whites, look to Greater Appalachia. In HILLBILLY ELEGY, J.D. Vance confronts us with the economic and spiritual travails of this forgotten corner of our country. Here we find women and men who dearly love their country, yet who feel powerless as their way of life is devastated. Never before have I read a memoir so powerful, and so necessary.